That bloke over there, looking at the church, looks familiar. Surrounded by rocky cliffs on both sides, the lake is a vivid emerald green and silence is the order of the day. 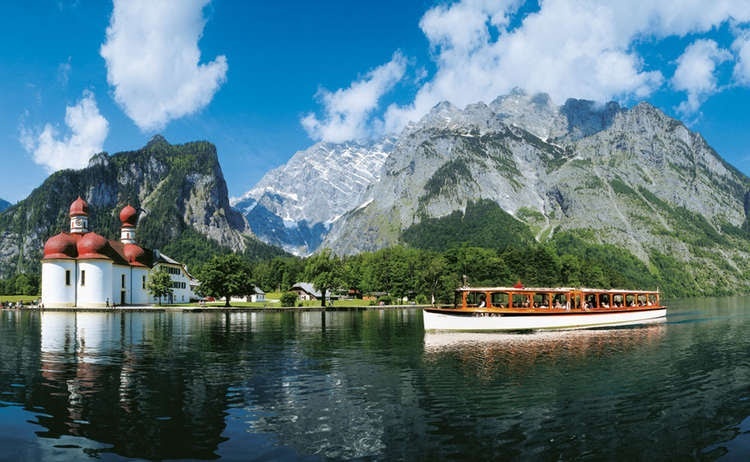 Only the electric powered tourist boats, plus rowing boats, are allowed and everything adds up to absolute tranquillity. At 5 miles long, it’s not a tiddler, but as it’s barely three quarters of a mile wide it reminded both of us at first sight of a Norwegian fiord. A couple of differences became obvious after glancing at the information as we boarded our boat: it’s 2000 feet above sea level and up to 650 feet deep. 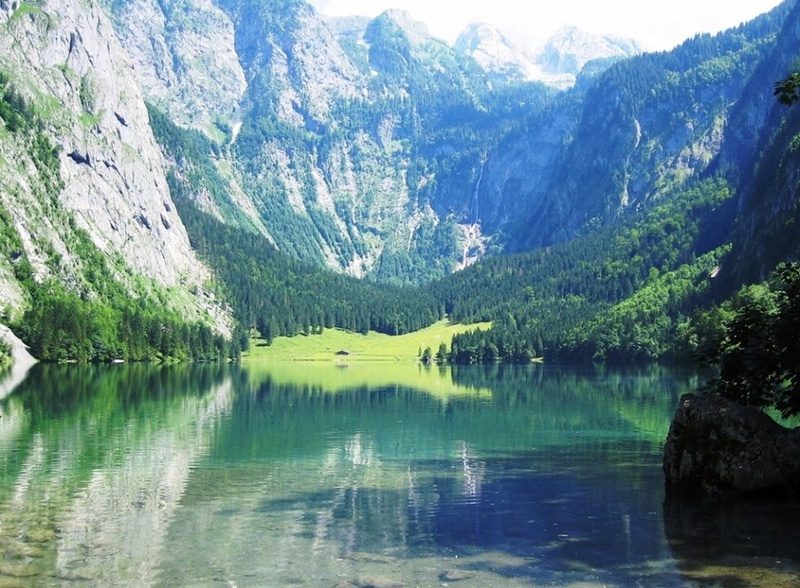 The deepest, the cleanest and by some way, apparently, the coldest lake in Germany. 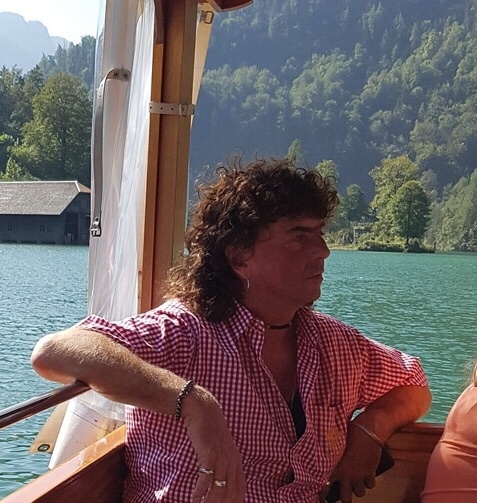 The state of Bavaria has owned the lake since 1834 and the rules are typically draconian: no fishing, camping, private boating, windsurfing allowed, but we saw a couple of (naked) men swimming – photos not deemed appropriate- and nobody rushed up to arrest them. Just as well as if they were tough enough to swim in water that nearly gave my trailing fingers frostbite, best to leave them alone. 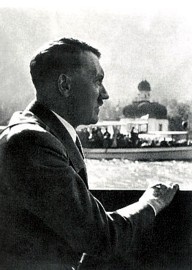 It seems Hitler liked it here, enjoying the peace and quiet, and there’s ample evidence of Eva Braun exercising on the lake shore. Easy to see why as the cool, green water and sheer rock cliffs make for an idyllic spot. Eva Anna Paula Braun was Adolf’s girlfriend for many years, but only Mrs Hitler for a couple of days. Not much of a honeymoon either. 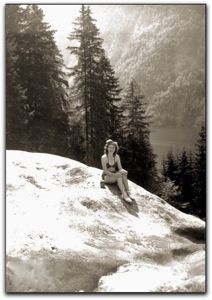 Anyway, judging by the photos of her doing yoga on the lake shore, it’s easy to see why he fancied her. 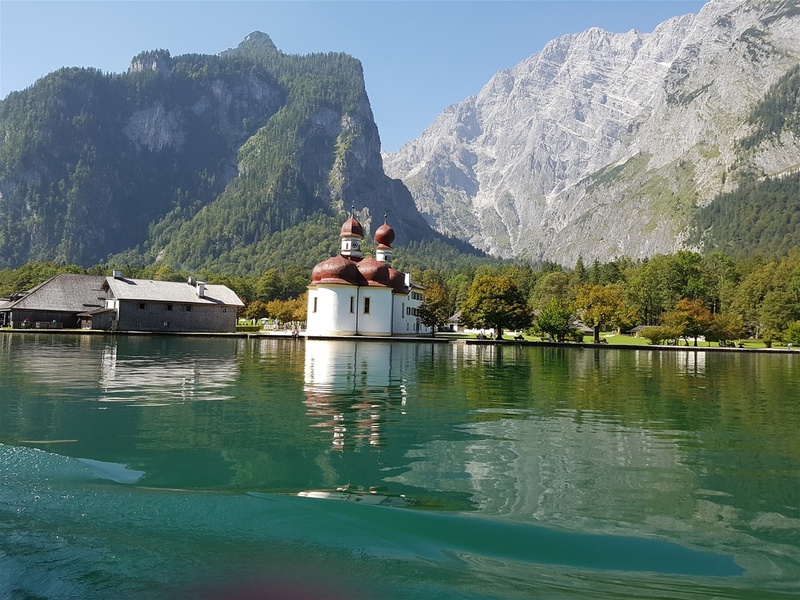 Lake Königssee has another trick up its sleeve: the rocks climb straight up from the water’s edge throughout its whole length, so walking around is out of the question. Getting to the other end means boarding a boat. We paid and discovered the next available sailing was not for well over an hour. Relatively undaunted we sat next to the jetty and ordered a coffee. Only one as it cost five euros! I know this place is popular, but five euros is madness. We decided to share a cup; usual arrangement, three quarters for me and the rest for G.
A very fat German couple overflowed the seats opposite. They ordered drinks and as soon as the waiter had gone they dashed off as their boat had arrived. When the waiter bought their drinks we told him what had happened and he ran off, pushing his way through the crowds, into the boat and we could hear him shouting. 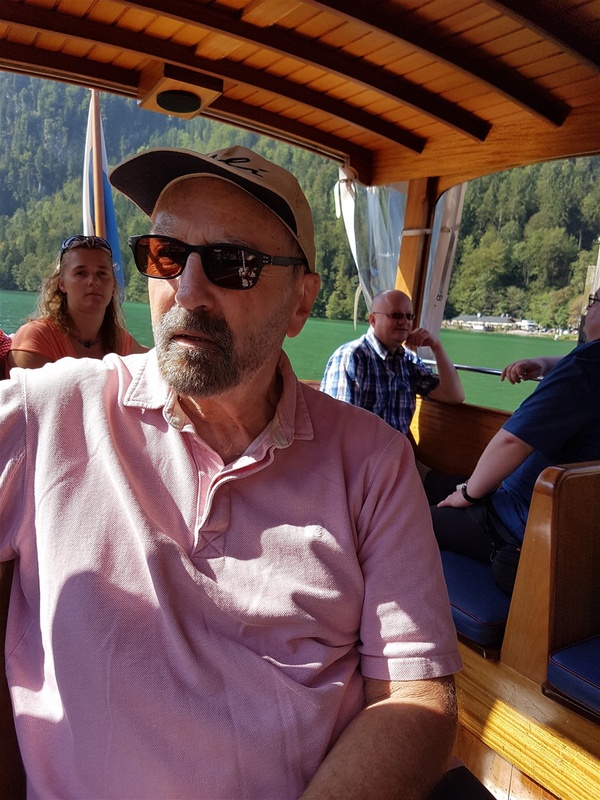 A few minutes later he came back, left the drinks – 2 small coffees, 2 glasses of water and a large beer – on the table and said, ‘you can have these, if you want. They're paid for.’ Result! Unfortunately, there was no cake. It pays to tell tales. Sad day today my new best friend Moniker is leaving for Munich. She said ‘we have no garden, like most people we live in a small apartment and share the facilities with four other families’. Poor Moniker. Her favourite tv programme is Columbo dubbed into Russian. She makes her own sauerkraut and black bread. She wanted to send me the recipes but I changed the subject quickly. G is convinced she works for the KGB as he thinks she asks intrusive questions. Like what I said. “Well she asked why I put milk in tea”. That obviously proves it. When she left we sort of hugged and she gave me her card and I now find her name is Marina, even though I have been calling her Moniker for days. Easy mistake! When the boat arrived we got good seats at the back. G always pulls a face when I say the back or the front of boats instead of whatever they’re supposed to be called, but it was the back bit, whatever that is. We tried to spread out and look big to stop anyone else crushing in next to us, but the only other couple near us, well the man really, turned out to be the German version of Elvis and people kept coming up to have their picture taken with him. He was really nice and had a long chat with G, in English. I asked G after what they’d talked about and he just said ‘football’ so I still don’t know who he is or why he’s so famous. Views from the boat were splendid. Reminded us of New Zealand. The boat driver stopped halfway and played a trumpet, which echoed around. It was wonderfully silly and we both tried not to laugh. He then came round with a hat for money. We only had a 20 euro note so pretended to look at the fish. Most of the others on the boat set off to climb mountains when we got to the other side, but we hung around for a bit, had a brief paddle in the icy water and generally messed about being silly until the next boat turned up to take us back. No sign if Elvis, must have gone for a yodel up the mountain. Weather is very hot and it has been a Sound of Music experience with huge meadows, cows with bells, houses full to the beams with flowers, everything lovely. 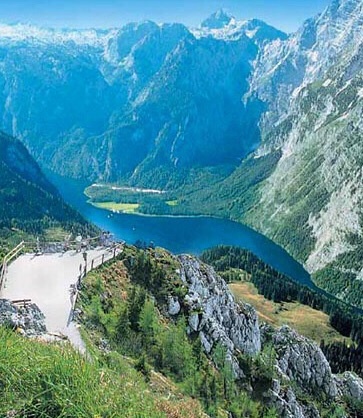 Can understand why so many people rave about the Bavarian Alps. We do too now. There should be a 'points system' to decide who is lucky enough to live here. Don't suppose we'd qualify though. Marigold - doing yoga on the shore. Oh sorry, it's Eva again. The Other End. Nobody left but us. Even Elvis has gone away.